New entrant Reliance Jio's free voice calls and aggressively priced high-speed mobile data has pushed the telecom industry into a state of high competition. Amid intense competition in the telecom sector, telecom companies are announcing new offers every next day. New entrant Reliance Jio's free voice calls and aggressively priced high-speed mobile data has pushed the telecom industry into a state of high competition. Many incumbent telecom companies have been revising their mobile tariffs and announcing new schemes to protect their market shares. Here are some of the recharge plans that come with the benefit of 1 GB data per day for the entire validity period. Under its special recharge plan priced at Rs. 448, Airtel offers 1 GB of 3G/4G speed data for a validity period of 70 days. The Rs. 448 pack includes unlimited local/STD calls and free national roaming, besides 100 SMS per day. 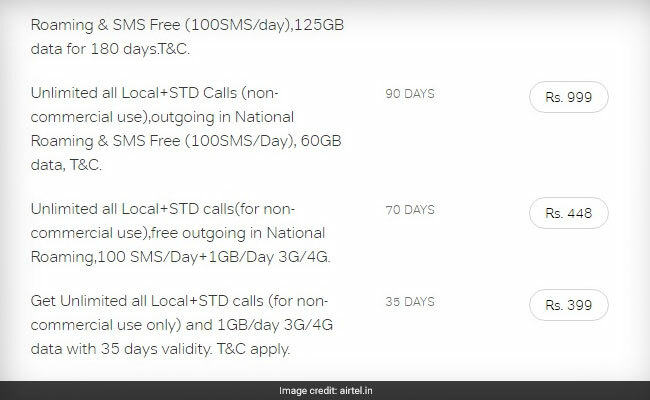 Under its recharge pack priced at Rs 399, Airtel offers 1 GB data per day at 4G speed as well as unlimited local/STD calls along with roaming outgoing calls. Airtel's Rs 399 recharge plan comes with a validity period of 35 days. Reliance Jio, which offers telecom services under brand Jio, offers unlimited local, STD and roaming calls and SMSes under its packs priced at Rs 309, Rs 399, Rs 459 and Rs 499, according to its website - jio.com. That means Jio customers subscribing these recharge plans don't have to pay extra for making calls or sending SMSes during the respective validity periods. Under its recharge plan priced at Rs 309, Reliance Jio offers 49 GB of high speed data for a validity period of 49 days with a daily limit of 1 GB. The daily limit is for high speed data. Customers continue to receive unlimited data beyond the high speed limit at a speed of 64 Kbps, according to the Jio website. Jio's Rs 399 recharge pack comes with 70 GBs of high speed data for a validity period of 70 days. Customers get 1 GB of high speed data every day for the validity period of 70 days under the Rs 399 pack. Customers continue to receive mobile data at a reduced 64 Kbps after exhausting the daily limit, according to the Jio website. Under its recharge plan priced at Rs 459, Reliance Jio offers 84 GBs of high speed data with a daily high speed limit of 1 GB. The Rs 459 recharge plan from Jio comes with a validity period of 84 days. Like all its other recharge plans, Jio offers "unlimited" data for the validity period under this pack. Under this pack, the first 1 GB of data is at high speed. "Unlimited data signifies Daily Limit at High Speed, followed by unlimited at 64 Kbps," Jio added on its website. Jio offers 91 GBs of high speed data for a validity period of 91 days, among other benefits, under its recharge pack priced at Rs 499. This pack too comes with a daily high speed data limit of 1 GB. Customers exhausting the daily high speed data continue to receive mobile data at a reduced speed of 64 Kbps, according to the telecom company's website. 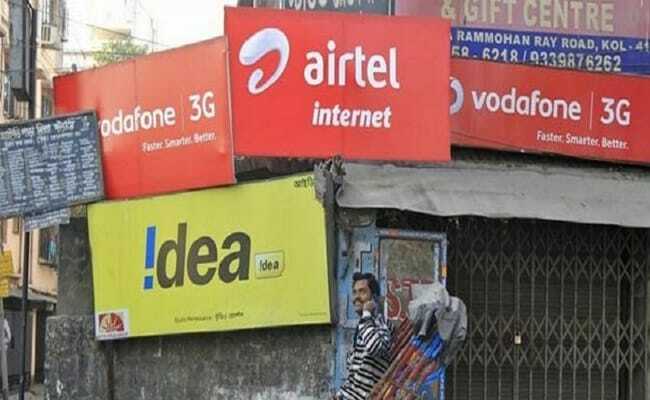 Under its recharge plan priced at Rs 349, Vodafone India - the Indian arm of British telecom major Vodafone, offers its prepaid customers 1 GB data at 4G/3G speed for a validity period of 28 days. Benefits under the Rs 349 recharge include unlimited local/STD calls to any number even while roaming within India, according to its website - vodafone.in. The pack allows up to 250 minutes/day and 1,000 minutes/week, Vodafone noted. "Get free Subscription of VF Play. To download,SMS PLAY to 199," Vodafone added.